Six Vanderbilt law students spent Spring Break 2018 doing pro bono legal work through the Appalachian Community Federal Credit Union, a community development financial institution based in Johnson City, Tennessee, through Vanderbilt’s Transactional Pro Bono Spring Break program. Assistant Clinical Professor Lauren Rogal worked with team leader Jenae Ward ’19 of the Law Students for Social Justice to organize the trip. 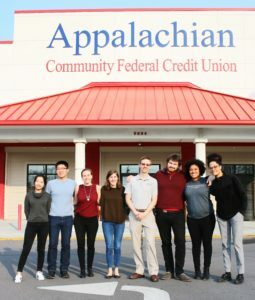 Students helped the ACFCU create a new nonprofit organization focused on improving the financial health of Central Appalachia. “After interviewing the client and getting a crash course in nonprofit law, the students drafted all of the governance documents, the application for tax-exempt status, and a contract to govern the relationship between ACFCU and the new nonprofit,” Rogal said. Team members also included Pin Gu LL.M. ’18, Alan Gao ‘18, Connor Crum ’19, Charlotte Gill ’19 and Latoya Bethune ’20. 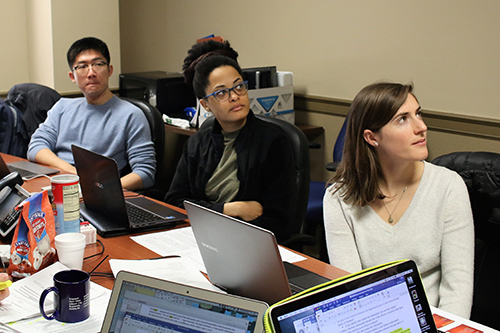 Students also supported efforts to expand the reach of Appalachian Mountain Project Access, a program that connects residents of northeastern Tennessee who lack medical insurance with donated medical care. To help the program enroll and educate more volunteers, students drafted an application form, a services contract, and a set of rules and regulations for the volunteer program. Rogal launched the Turner Family Community Enterprise Clinic, a new clinic that supports nonprofit organizations with a variety of transactional legal services, this spring. The ACFCU Pro Bono Spring Break Trip to Johnson City was one of two Pro Bono Spring Break trips sponsored by Vanderbilt’s George Barrett Social Justice Program, Law Students for Social Justice and the Office of Public Interest. A team of seven Vanderbilt Law students traveled to Lumpkin, Georgia, where they worked with attorneys from the Southeastern Immigrant Freedom Initiative to represent detainees at an Immigration and Customs Enforcement detention center in Stewart County, Georgia.